We can help you find an effective solution to behavior problems and training issues no matter what the reason. Do you want a more well-mannered or responsive dog? Are you feeling overwhelmed by your dog’s behavior? Is your dog experiencing behavioral problems? 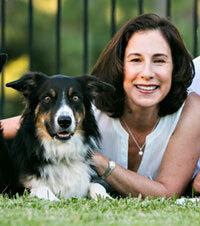 Are you feeling anxious about all the work involved in changing your dog’s behavior? Are the group classes at a bad time and difficult to work out? Do you just want more personalized attention to work on your specific training goals? Although we also provide training in traditional group class settings, we recognize that sometimes, for a number of reasons, classes are not always the best approach for everyone. Whether because of busy schedules, dog temperament or behavior issues or just for the convenience, we believe that these things shouldn’t stand in the way of having a happy and well-trained dog that’s a welcome member of your family. In order to help you and your dog, we’re happy to provide private training here at Lucky Dog or at your home or other appropriate environments — tailored to fit the needs of you and your dog. We often recommend that everyone responsible for training the dog attend the sessions (unless you opt for Day Training, see below). If the need for private training is because of a behavioral issue, we can tailor a training and behavioral modification program for many behavior problems that occur. Here are other things you should know. We use no-force, positive-reinforcement methods of training backed by sound scientific learning theory. We have a Certified Professional Dog Trainer who will work with you to develop concrete and realistic solutions to the problems you are facing with your dog, then give you the tools and support you will need to teach your dog good behavior or improve obedience skills. Preparing your dog for the arrival of the new baby. Building a solid and safe relationship between your new puppy or dog and the kids (see the Family Dog All Stars Program below). We can also schedule private instruction in dog agility. You are in a group class but want some extra help. Your private consultation and training includes several steps. Provide a written report of the session and handouts to help ensure your success as you continue to practice at home. Day Training is another option. We can come to your home during the day and train your dog while you’re away. Puppy parents who are unable to be home all day. We can help socialize your puppy, take him/her out to potty, train basic behaviors, provide play, exercise and attention. Anybody who simply wishes to have a Professional Dog Trainer train their dog for them. Periodically we will meet with you so we can show you what your dog has learned and teach you how you can continue the training. It’s the perfect solution for families with kids between the ages of 4 and 9 years of age. We will help you engage your children in learning the correct and safe ways to interact with that new puppy or rescue dog, building a long-lasting, happy relationship. There are lots of short interactive and fun videos that will keep your kids involved and you learning. Your puppy or adult dog is also involved in the learning process, gaining new skills to be a valued and polite member of the family. CLICK HERE to find out more about this wonderful program that is perfect and special for the whole family. at 561-427-6700 (or email ) to learn more about how we can help you have the well-behaved dog you are happy to share your life with. Call 561-427-6700 to discuss your training goals or your dog’s behavior issues with Mindy Cox, BS, CPDT-KSA, Trainng Director.We will schedule an appointment that’s convenient for you. If you are not currently a client, please register now so we have complete information about you and your dog. To begin the process, please click here now. If this appointment is for behavior issues we may ask you to fill out a consult form and return it to us as soon as possible before your scheduled appointment. (See the consult form for behavior issues link below). This will help us get a fuller picture of the issue prior to your appointment. If the appointment is for routine training, this form will not be necessary. We will let you know if the form is needed. *Private Lesson Cancellation Policy: You may cancel within 48 hours of the scheduled appointment with no charges incurred. If you cancel with less than 48 hours notice you will be charged a $25.00 fee and the balance of the amount will go on your client account as a credit to be used for a future appointment. If you cancel less than 24 hours in advance you will be charged a $40.00 fee with the balance of the fee as a credit that can be used toward a future lesson. If you don’t provide any notification and don’t show up for your scheduled appointment, you will forfeit the entire amount of the consultation fee.